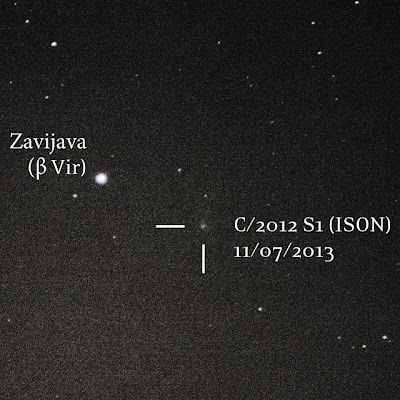 I've been reading a lot about Comet ISON (C/2012 S1) already visible to amateur astronomers in the early morning sky over the Eastern horizon. 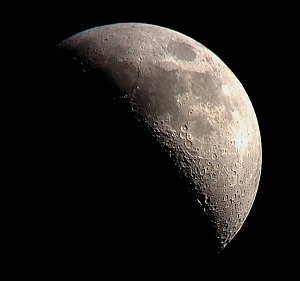 At magnitude 7.50 on the morning of November 7, 2013 I figured I could try to pick it up with the DSLR and 300mm lens. 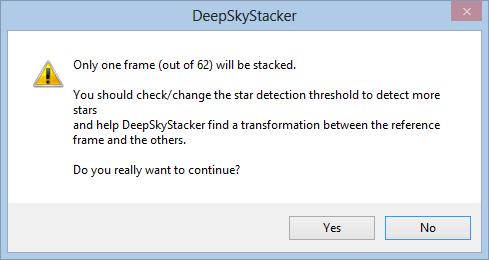 After all, I've picked up magnitude 9 or 10 stars through stacking in DeepSkyStacker (DSS), and since a comet is more compact than a galaxy (whose visual magnitude is spread out over a greater area) I knew I could grab it. 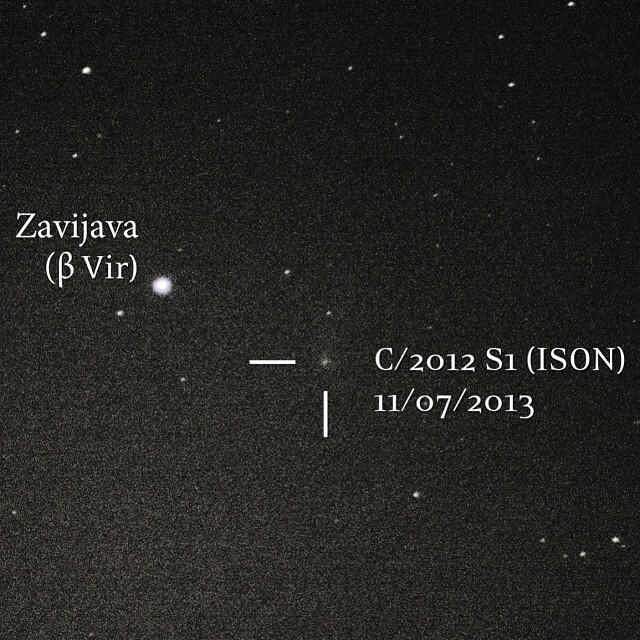 It was very easy to find Comet ISON in the sky, below Mars and right on top of Beta Virginis (β Vir), one of the brighter stars in Virgo. 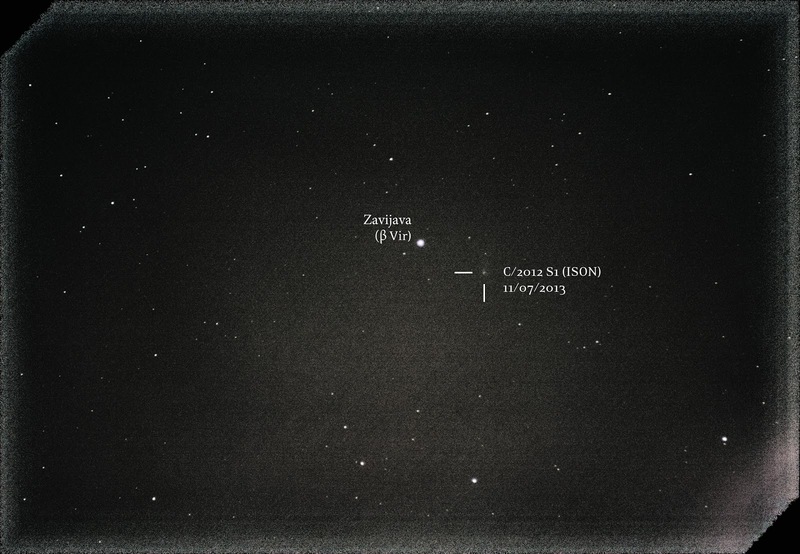 They were actually about 24 arcminutes apart (less than 1°), and both easily fit into my field of view - which was good because I couldn't even see ISON in my view finder. ISON was relatively high in the sky, about 28° alt, which was different for me because the only two comets I've photographed previously have been about 10° above the horizon at twilight. While I was stacking these, I had something happen that's never happened before. I got an error in DSS that said "only one frame (out of 62) will be stacked. 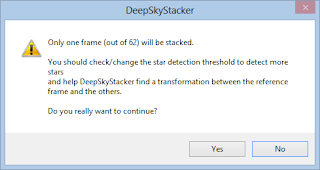 You should check/change the star detection threshold to detect more stars and help DeepSkyStacker find a transformation between the reference frame and the others." I had the star detection threshold on the lowest setting (2%) which tells DSS to treat anything that looks like a star as a tracking/alignment option. In photos of the Milky Way, having DSS on 2% would produce tens of thousands of traceable stars (and take forever to stack). However, in my light frames, DSS was only picking up 6-9 stars. 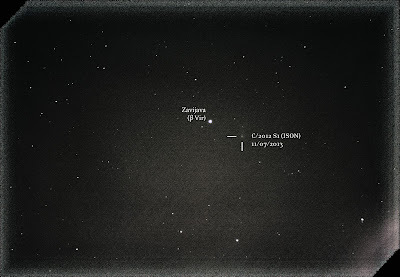 To solve this problem, I went back to my RAW files in Adobe Camera RAW, and lightened the frames up so the stars that were in the frame would be brighter and easier for DSS to pick up. I saved them as TIF files and loaded them into DSS. Then I got an error saying my light and dark frames were different file types, so I had to go back and save my dark RAW files as TIF files just to make them match. In the end it worked, and I'm pleased I was able to troubleshoot this little issue on my own while still producing an image of Comet ISON.